Ask yourself, how many hours have you spent optimizing your pricing in 2017? Odds are, not nearly enough. That’s a serious problem. Why? Pricing is the foundation of how you make money as a business, and nailing your pricing is critical to the long-term viability of your company. So what can these companies (and likely many of you reading this article) do about it? This new year, resolve to finally fix your broken pricing model and stop making these seven fatal pricing mistakes. What do your buyers say when you ask them about your value, ROI and pricing? Have you asked them? 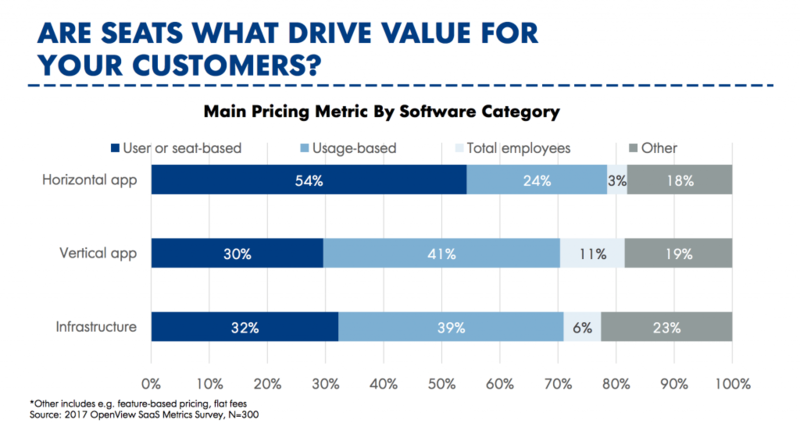 In my work with OpenView’s portfolio companies and past life in consulting, I’ve gathered pricing feedback from thousands of software buyers across all markets. A common theme – especially among early stage companies – is that your buyers think you’re a cheap date. I’ve even heard some extreme examples, for instance, that pricing is so cheap buyers worry you can’t build a sustainable business in the long-run. 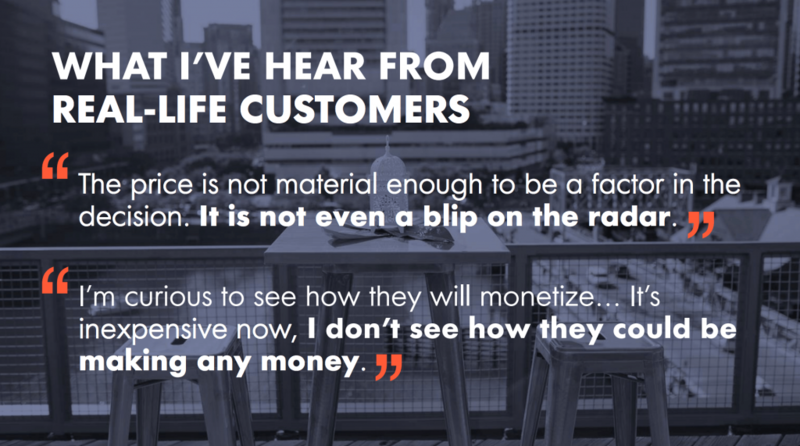 The feedback you hear from your buyers might not be this extreme, but likely points to opportunities to raise your price over time. The benefits of raising your prices can be huge. Take StatusPage, the leading hosted status page provider, which was acquired by Atlassian. As Co-Founder Steve Klein describes in detail, StatusPage started out with two price points – free and $49/month. Over time, they removed the free tier and managed to raise prices by up to 8x with minimal impact to conversion or churn. This was a key lynchpin in their efforts to grow average revenue per user (ARPU) by 2.4x and reach a $2.5M annual revenue run rate over the course of only two years. (By the way, in looking at their pricing page, StatusPage has continued to follow this playbook to capture incremental revenue upside). As you grow and mature as a company, it’s natural to bring on functional experts in sales ops, finance, HR, demand gen, marketing ops, professional services…the list goes on and on. But have you hired anyone who knows how to optimize your pricing? 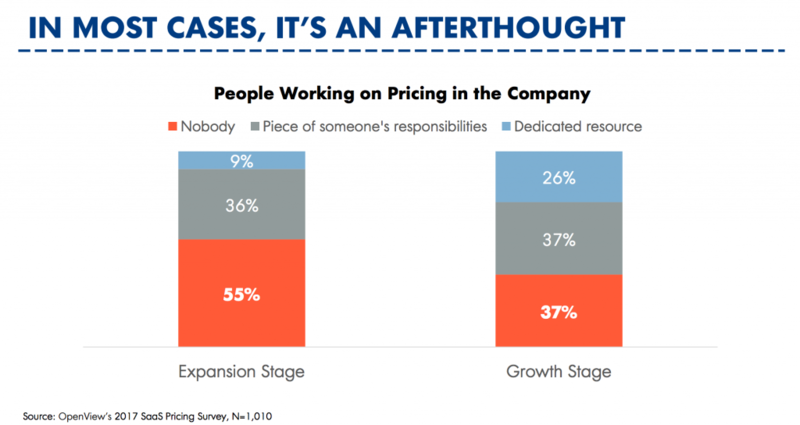 55% of expansion stage SaaS companies say that nobody in their company is working on pricing, even as just a piece of their responsibilities. Failing to allocate resources to pricing means that no work gets done to understand the value you bring to your customers and how you can capture more of that value. Pricing can be owned by a number of different teams – Marketing, Product, Finance, Sales and Ops – and there are pros and cons associated with each. As a general rule of thumb, putting someone in charge of pricing is more important than where they sit. Pricing starts with your value metric, which is the unit you have to communicate, measure and capture value from your customers. It’s critical to pick the right value metric or set of metrics for your product because doing so allows you to address distinct segments in the market, scale your pricing over time and differentiate from alternatives. Too often, companies default to charging based on users. This is especially true for horizontal SaaS applications. 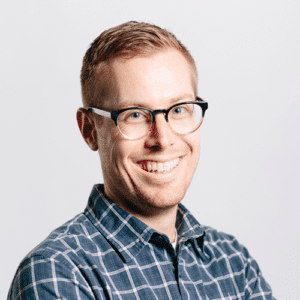 Ask yourself: are users really what drive value for your customers? You instinctively know this already: it’s much easier (and cheaper) to sell into an existing customer than it is to acquire an entirely new one. What’s more is that net negative churn, where the collective value of your customers actually increases over time even after accounting for lost customers, is a critical component that facilitates rapid growth. How well do your products and packages create a natural expansion path for customers? In many cases, companies start with only one main package or edition for their customers. As your product and customer base matures, you have a major opportunity to create new, higher tier editions (at higher price points). Salesforce exemplifies this pattern. 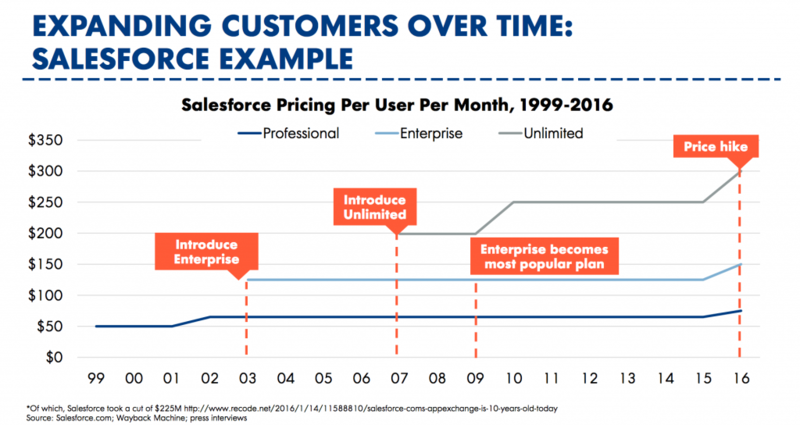 We used the Wayback Machine to investigate how Salesforce’s pricing has evolved over time for their flagship CRM product line. In their first few years, Salesforce only had one offering – the Professional edition at $50 per user per month. Later on, they introduced an Enterprise edition (at 2x the price point) and then the Unlimited edition (at 3-4x the price point). They now also have a host of add-on offerings, not to mention their popular AppExchange, to drive further account expansion. Ready for more pricing best practices? To find out all 7 pricing mistakes fill out the form below. What mistakes have you made when it comes to pricing? How did you correct those, and what impact did it have to your business? We’d love to hear from you in the comments!